﻿ Thoughts on "Dragon Watch"
True, we did not see this coming when we first asked one of our senior science editors, Dr. Ron Shimek, a marine zoologist and consummately well-read ecologist, to look into reports of some odd climate phenomena in Siberia and how they might relate to extreme predictions that all coral reefs, as we know them, could be gone by the year 2050. What he came back with has shaken the lives of everyone here who has read his report, which finds that global climate change may have the potential to come more quickly and catastrophically than any of us had ever imagined. In the end, this is a story about a small core of dedicated, unsung (and allegedly censored) oceanographers from Russia, Sweden and the U.S. looking into the waters of the North Polar regions and coming up with some very ominous findings that may impact life on Earth in profound and unstoppable ways. It is disturbing reading, but we think it is worth being considered, investigated, and, something world powers must not continue to ignore. Part II will provide further facts as well as possible ways humans could try to intervene. Feel free not to read it, but we personally believe that the Devil You Know is less terrible than the one that appears by total surprise. Be forewarned: there be some fearful dragons here. 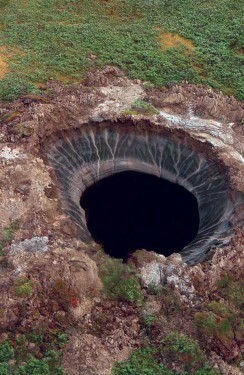 From Ronald L. Shimek, Ph.D.
2014 blowhole in the Siberian permafrost. Back in 2007, in preparing for some lectures on global warming, I headed to the library to make sure I understood the research literature explaining what was going on with climate change dependent on greenhouse gases. One of the items I discovered that some people considered a potential problem was a material called methane ice, or methane clathrate, a related group of materials made of water and methane containing a great deal of methane, a very potent greenhouse gas, encased in ice. At the time there was very little discussion about methane’s role in global warming; being a very minor atmospheric constituent, it was essentially ignored and the effects of carbon dioxide took center stage. Although I thought methane deserved more than a passing statement, my lecture time was limited, so I didn’t spend a lot of it on natural gas. My closing statement to my class, however, was this: “Be alert for news regarding Arctic methane emissions. Signs of any significant methane emissions are an indication that we are in very deep trouble.” The potential for methane to wreak havoc with the climate, although it seemed unlikely, was clear 10 years ago. When asked to investigate an odd news item about craters appearing in the Siberian tundra due to methane explosions and write a short blog post that might lend some additional credence to global warming’s effects on coral reefs, I (figuratively) jumped at the chance. The mental image of flying over northern Siberia watching the tundra pop like a frying pan filled with popcorn was too good to refuse. In hindsight, I wish I had refused. The statement “Ignorance is bliss” continues to haunt me. I think I would rather not know of the catastrophic potentialities that I wrote about for this issue of CORAL. It was but a short segue from frozen methane clathrates in tundra permafrost to methane clathrates in the shallow sediments of the East Siberian Arctic Shelf (ESAS), one of the largest continental shelves. Reading my article, you will see it is largely based on the first-rate work done by Dr. N. Shakhova and a team of Arctic scientists and a much larger group of associates working at labs in the United States, Sweden, and Russia. Since their findings were published, a few other researchers have contradicted what they found. I urge you to read the publications by Shakhova’s group, then read those by her critics. It is apparent that her critics misunderstood her premise. All articles are listed as references here: http://www.reef2rainforest.com/2016/04/22/dragon-watch/. Shakhova’s group is discussing the imminent and disastrous release of large amounts of methane from the shallow benthic sediments of the ESAS, while her critics are discussing the possibility of similar releases from deep-water methane clathrates—and the two systems cannot be more different. In short, deep-water methane clathrates are solidly frozen materials that would not release methane in any large amount without a great deal of heating. Shallow-water methane is bound in the upper sediment layers of an Arctic sand substrate that has been heated almost to melting several times. Shakhova describes it as being like slush; I suspect that “silt-flavored slurpee” would be a good description. It is frozen, but just barely, and a temperature rise of 1–2ºC will trigger what Shakova calls “a catastrophic release.” The temperature in that part of the Arctic Ocean has been rising each summer, and as the ice-free time increases, so does the temperature. 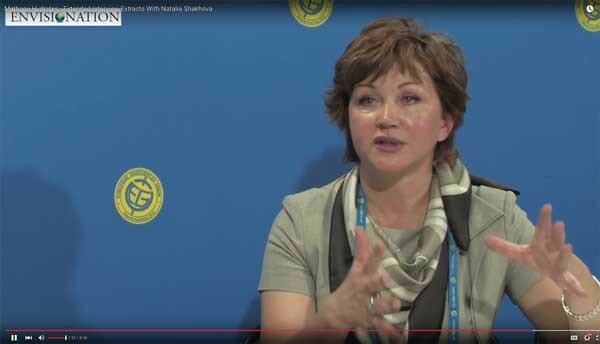 If you read my article, please also read the references that have been provided and listen to this 8-minute excerpt from a much longer interview with Dr. Shakhova, recorded at the European Geophysical Union meeting in 2012: www.youtube.com/watch?v=kx1Jxk6kjbQ. CORAL will post my article online, and comments are welcome. I hope to write follow-up articles in the future, but I am unable to respond to individual comments or emailed questions about this article. I will be glad to give a presentation about this material for anybody who wishes. I cannot help but wonder if there will ever be a Part II. I have watched for it and so far it is not forthcoming. Is this subject not suitable for Coral Magazine readers or has it also been censored?